The Ebbe Und Flut (in English, Ebb and Flow) is the brainchild of German engineer Carsten Schippmann. Initially conceived as a simple filter box, it took on a life of its own as its designer added facilities including compression, distortion, dual envelopes, an LFO, sample & hold, and a VCA. The result is an impressive package of features in a neat 2U box. Looking at the control panel, it's not obvious that the E&F is, in effect, a bunch of semi-modular analogue synthesizer modules in a single case. The filter knobs and their surrounds dominate the front panel, so it looks like a pair of VCFs with their associated controllers. But when you look around the back, you'll find that many of the sections have control inputs and signal outputs, much as you would obtain if you bolted a selection of synth modules into a rack. Returning to the front, the impressive control panel boasts no fewer than 41 knobs and switches. Not all of these are intuitive, and despite the well-presented 68-page manual, the explanations are not the clearest I've ever encountered, so it's not always obvious what's going on. Ultimately, I had to experiment to find out what the E&F could do. The input section starts with a level control and a switch that provides three signal paths through the device. 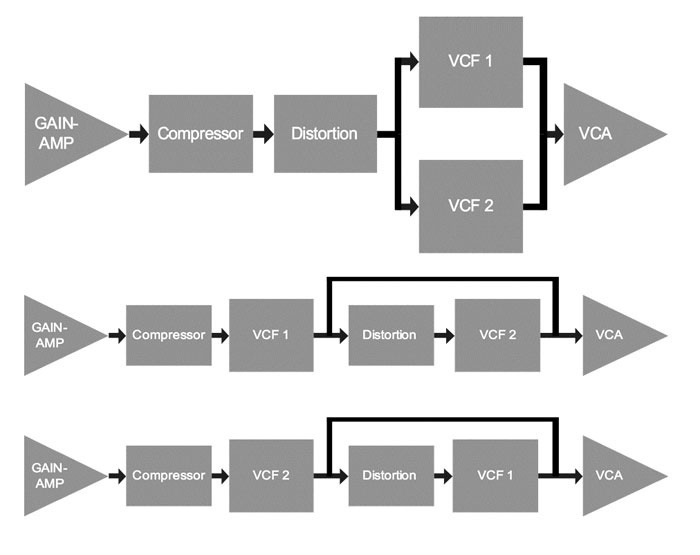 These are: input-compressor-distortion and then to both filters in parallel before the VCA; input-compressor-VCF1 and then two paths, one direct to the VCA and one through distortion and VCF2 before the VCA; and finally input-compressor-VCF2 and then two paths, one direct to the VCA and one through distortion and VCF1 before the VCA. Confused? So was I, but things became clearer when I discovered that — as well as offering different filter characteristics — the two filters have subtly different characters, so the results obtained using the second and third options are not necessarily the same. The different signal paths are illustrated in the diagram on the last page of this review. The compressor has just two controls: ratio and a fast/slow response switch. Likewise, the two-band distortion unit has two: the amount of gain and a cunning little switch that changes the crossover frequency of its low- and high-frequency signal paths. Moving on, we come to the filters themselves. Each offers 12 filter characteristics, with a wide selection of low-pass, high-pass, band-pass, band-reject and all-pass responses. Testing the filters' bandwidths, I found that they ranged from subsonic to supersonic, as promised. Interestingly, the cutoff frequencies respond at a rate of 0.5V/oct, which makes them more sensitive to modulators, but also means that you will need an adaptor (or to undertake a bit of soldering) to make them respond musically to 1V/oct control signals. Each filter is controlled by 12 primary parameters; there are cutoff frequency and resonance controls, of course, as well as independent AHR (attack, hold, release) envelopes with amount and positive or negative polarity, a pedal CV input, and two controls that allow you to determine the amount of modulation applied by your choice of the envelope, sample & hold and a multi-waveform LFO. There is also 'dyn', an envelope follower that generates a controller from the amplitude of the input signal, and you can apply this directly to the cutoff frequency or use it to control the envelope generator. At the end of the signal path, a knob allows you to mix the contributions from VCF1 and VCF2, and a single VCA placed after the mixer can be controlled by either ENV1 or ENV2, or Gated open. 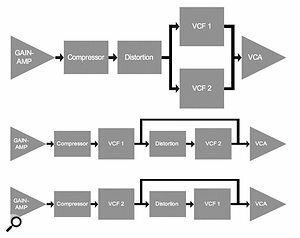 In the last of these positions, the VCA acts as a noise gate, suppressing any background noise generated within the E&F (of which more, later). Finally, a bypass switch allows you to compare the signal entering the E&F with the processed version. Unfortunately, there's no way to equalise the levels of the input and output signals, and no final output level control, both of which seem to be huge oversights. You're far more likely to use a number of low-cost stomp boxes or a DSP modeller, but the E&F can be used quite effectively as a guitar processor, supplying compression, distortion, filter effects, and — if you take advantage of the envelope follower — dynamic effects such as variable-rate modulation and auto-wah. If you patch the thing appropriately, you can also use the guitar to trigger other sounds. There are depths here yet to be plumbed. The E&F will keep even the most advanced analogue junkie up until the wee small hours. Not only is it complex in the way that a modular synth can be, but it's intriguing in that it does what it does in unusual ways. This means that it is not only an alternative to other manufacturers' filters, but can sit alongside them and offer a different range of sounds and effects. As for the sound itself, this can be warm, fat, thin, aggressive or smooth as you choose. I particularly liked the excellent VCF1, which has a round and full character that I think will appeal to almost anyone who has a penchant for analogue synthesis and signal processing. The Ebbe Und Flut offers all sorts of modular routing possibilities, but it's rather a shame that the sockets are hidden away at the back of the unit.To investigate this, I used a Roland SH101 — not the fattest or the most aggressive monosynth on the planet — to provide an audio signal, a controller CV and a Gate, all of which I patched to appropriate points on the rear panel of the E&F. I then played a simple, unfiltered sawtooth wave through the 24dB/octave low-pass option in VCF1 with the compression and distortion set to zero, the filter wide open and the resonance set to zero. Switching between the original and 'processed' signals demonstrated that, even with no filtering applied, the E&F imparted a warmth to the original, partly because there is some gain in the signal path, and partly because there is a subtle boost to the low frequencies. Moving on, I set up a typical 'filter sweep' patch on the SH101 and then recreated the settings as best I could on the E&F. The result from the latter, as I expected, was more aggressive, and more attention-grabbing. If I then dialled in some compression, I obtained an amazing 'snap' at the beginning of notes, especially on the slow setting, as the make-up gain in the compression circuit created a big transient at the start of the note. However, this was where I began to notice the amount of noise generated by the Ebbe Und Flut, which was later to become a major issue in my overall view of the product. As I experimented further, adding distortion and further modulation, I found that the SH101 was no longer sounding like an SH101, and that the tonal quality had become chameleon-esque, covering a huge spectrum of synthesizer timbres as I tried all the filter types available. I was obtaining fat 'American' sounds reminiscent of Moogs and ARPs, the thinner and somewhat purer sounds of Japanese synths such as Korgs and Yamahas, and — as you would expect from a filter system of this complexity — sounds that one would normally expect to hear emanating only from modular synths. All this, and I hadn't even started to patch complex setups using the inputs and outputs on the rear panel. Doing so, I hooked the E&F into the signal and control paths of my RS Integrator, and despite needing a goodly quantity of quarter-inch to 3.5mm converter leads, I found that the E&F was quite happy with the audio and CV signal levels, and integrated well. Again, it imparted a different character to the sounds I was creating and complemented rather than replaced the existing modules in the system. Unfortunately, the initial promise of the Ebbe Und Flut is let down by two problems; one sonic, the other physical. These diagrams from the Ebbe Und Flut's manual show the different signal routing possibilities.As I have already hinted, the E&F is noisy. With no signal presented to the audio input and the compression and distortion set to minimum, I measured the background noise in bypass mode at around -92dB (RMS), which was probably the noise floor of the low-cost A-D that I was using to convert the signal for the digital metering software. Flicking the bypass switch to 'on' to hear the noise generated by the E&F's filter paths raised the level by about 7dB, and — even without anything connected to it — the unit now generated a clearly audible background hiss. Surprisingly (given that nothing was connected to the audio input) adding compression raised the noise level further; by 15dB or so to -70dB (RMS) at the maximum setting. Then, adding distortion (which is just clipping generated by overdriving the filters' input stages) raised the background noise level to a massive -34dB (RMS), which would give any studio engineer serious headaches. When testing the E&F through a colleague's PA system, I found that the noise seemed less intrusive, so you may not find it to be a problem if you plan to use the E&F as a signal processor for, say, a guitar, or through a PA or in noisy environments. Also, although controlling the VCA using either of the envelopes masks the problem to some extent, you may not want to shape the amplitudes of your sounds in this way, and you can still hear the halo of noise around the wanted sound — so this is at best a partial solution. The second problem is no less frustrating. Despite the front panel looking great, it lacks a number of things. Well, 21 things, to be precise — the first of which is the mains switch. The E&F is a rackmount module, for heaven's sake! How can it have its on/off switch on its rear panel? The other 20 omissions are the I/O sockets. The only way to tap the Ebbe Und Flut's full potential is to bring all 20 connections to the front of the rack using a patchbay and 20 patch cables. Apart from the inconvenience it causes, this adds another £100 or so to the price. It's hard to compare the E&F to other products, simply because I'm unaware of anything in the analogue domain (or any combination of things in the analogue domain) that would precisely duplicate its capabilities. You could argue that a couple of Analogue Systems RS110 multimode filters (£90 each) come close if racked with a pair of RS60 envelope generators (£85 each), an RS80 LFO (£85) and an RS40 S&H module (another £80). Add a couple of hundred quid for a Eurorack case and another hundred for an external compressor/overdrive unit, and you get a total of £815. This is considerably cheaper than the Ebbe Und Flut, which retails for 1665 Euros (around £1100). However, the comparison is not like-for-like. The modular system would be much more flexible and, given the accessibility of the patch points, much easier to use, but the E&F is neater in its single 2U case, and has a deeper character that you may prefer. I really, really want to like the Ebbe Und Flut. It's chunky, robust, it feels like an expensive labour of love and it offers some interesting capabilities that could perk up almost any existing synthesizer or sound source. But I'm afraid that the noise level concerns me, and I'm not prepared to plumb in a 20-way patchbay to use it. If Carsten Schippmann wants the E&F to become a mainstream product, I believe that he has to address both of these issues. If he does so, I think that the Ebbe Und Flut could begin to justify the significant price it demands. It looks and feels well-engineered and expensive. It's a well-specified and flexible signal processor. The basic nature of its sound and processing is excellent. Its signal path is too noisy for my taste. The on/off switch and patch points are inaccessible on the rear panel — a serious problem when rackmounted. The Ebbe Und Flut has many good points, but is let down by two significant flaws. With a quieter signal path and convenient patching, it could be an excellent module, both for use within a modular synth and as a general signal processor.